Vietnam After 2016: Who Will Lead? To answer this question, we must first identify the most influential leaders of the party establishment and, second, consider who among them is likely contending for the post of general secretary. Close observation of those leaders sitting at the central table at each of the recent major party meetings yields five familiar names: Lê Hồng Anh (Politburo Standing Committee Chairman), Nguyễn Tấn Dũng (Prime Minister), Nguyễn Sinh Hùng (National Assembly Chairman), Trương Tấn Sang (President), and Nguyễn Phú Trọng (General Secretary). Backed by strong support from party elders, Anh and Trọng are seen as having led the pro-Chinese conservative faction in direct opposition to Dũng (who leads the pro-Western reformist faction). Between them le the reform-oriented moderate faction led by Sang and Hùng. All operate within a fairly recent party oligarchy (guarded by its military, security, and political elites, who have their own particular interests). Even though they have not publicly declared their candidacies, each of these senior figures may well aspire to sit in the hot seat of supreme power. Their policy moves and political activities can reveal both the motives they conceal and constraints they face. Of the five, Anh and Hùng can likely be discounted, leaving Dũng, Sang, and Trọng in place to fight it out for general secretary. According to most observers, Hùng is politically the least influential of the five and may be succeeded by his National Assembly Deputy Chairwoman Nguyễn Thị Kim Ngân, whose “confidence vote” scores for her parliamentary leadership performance have been consistently high. Minister of Public Security General Trần Đại Quang is another possible candidate. Anh, the Standing Committee chairman, is one of the most powerful leaders of the pro-Chinese conservative faction led by Trọng. However, he appears to prefer wielding political power behind the scenes, rather than contending for the general secretary post. Even if he was interested, his candidacy would be a long shot given that he would need to overcome his image as a tough former minister of Public Security as well as his “Chinese connections” (like those of Trọng and Defense Minister General Phùng Quang Thanh). Sang and his moderate faction, meanwhile, appear to have been marginalized politically. Indeed, Sang’s candidacy for general secretary likely sank following last year’s oil rig crisis, when he was seen to have failed to be “presidential.” Ultimately, Sang may throw his political support behind either Dũng or Trọng, following some political bargaining. His supporters may prefer that he redeem himself with a more dignified exit. What is thus shaping up is the final phase of a power struggle for party-state leadership between Dũng and Trọng, representing the pro-Western reformist faction and the pro-Chinese conservative faction, respectively. Within this context, I argue that Prime Minister Nguyễn Tấn Dũng will be the next general secretary, barring a major upset. I offer six reasons for this. First, Dũng will most likely win simply because his archrival Trọng has failed to offer the Vietnamese Communist Party a politically capable leader who can be seen as a superior candidate for the post. Trọng is due to retire after the 12th party congress but has failed to find a politically credible successor because he has unwisely surrounded himself with pro-Chinese party functionaries and die-hard ideologues, rather than the technocrats that Dũng has skillfully chosen to maximize and diversify his party-state influences. Trọng’s days are numbered and his options for a successor as general secretary and for other power seats in his faction have diminished. With the candidacy of Phạm Quang Nghị, first secretary of Hanoi, stumbling after his ill-timed U.S. visit last July, it seems that Trọng and his camp have been grooming Defense Minister General Phùng Quang Thanh to either succeed Trọng as general secretary or to take over from Sang as president. The first option is unrealistic, given Thanh’s liabilities: his uncharismatic image, his “pro-Chinese” position, and the massive corruption charges mercilessly levelled against him by an extremely controversial blog called “Chân Dung Quyền Lực” (The Profile of Power). The second option, meanwhile, a diplomatically desirable state leadership position, which Carl Thayer suggests could maintain a vital hot link with Beijing, looks more realistic politically, but will nonetheless be an uphill battle. Still, it may explain Thanh’s high profile recently, at home and abroad. For example, Thanh accompanied Trọng on the latter’s highly publicized trip to Beijing in April, hosted Chinese Defense Minister Chang Wanquan for a joint friendship tour along the Sino-Vietnamese border in May, hosted U.S. Senator John McCain Secretary of Defense Ashton Carter in the same month, and visited France in June. While in France, though, Thanh was suddenly “hospitalized,” leaving his candidacy looking rather bleak. The second factor in Dũng’s favor is that he has the ascendency in the power struggle against the Trọng-led/Beijing-supported conservative faction and has thus neutralized the most deadly obstacle to his peaceful and politically legitimate rise to power. The initial power showdown came in October 2012 when Trọng attempted to remove Dũng from power by having the Politburo to cast a “no confidence vote” against him for his mismanagement of the economy. But the Party Central Committee came to Dũng’s political rescue when it voted to support the embattled prime minister for his overall economic leadership performance instead. This was a major political victory, even if not a complete one, not just for Dũng and his reformist faction, but for the new state as the equal of the old party (the latter still under the firm control of the conservatives). That brings us to our third factor: Dũng has won the political support of the existing Central Committee and influential party elders and can thus secure the critical votes of the next Central Committee. All four “major reasons” that Lê Hồng Hiệp offers in his explanation of Dũng’s “growing influence over the Central Committee” are valid in my view. If Dũng can make good use of “his current political capital to get his protégés and allies elected to the new Central Committee, it is highly likely that he will be elected the next CPV General Secretary.” However, there are some other strategically important reasons why the existing Central Committee has backed Dũng consistently in opposition to Trọng and his powerful Politburo associates, and so will the next Central Committee. First, it is strategically imperative for the Central Committee to maintain a balance between the two most powerful factions of the Vietnamese Communist Party – the pro-Chinese conservative faction led by Trọng, and the pro-Western reformist led by Dũng – so that party unity can be dialectically guaranteed. By orchestrating this kind of internal party duality (thesis/antithesis) rather than destroying the opposition (the internal antithesis) as President Xi Jinping has been doing in China, both party/state conflict and party/state harmony can be maintained, allowing both the party and Vietnam to retain their independence despite the power politics games played by external actors such as China, the United States, Japan, Russia, and India. Second, by maintaining internal party duality, the Central Committee members can also maintain and protect their personal and factional powers and interests in the way that works best politically and structurally. This in turn may help them avoid be the ultimate disaster: “cảnh nước mất nhà tan” (the country lost and the family destroyed scenario). Why? Well, if the pro-Chinese faction were allowed to emerge as the sole ruling power with the Dũng-led faction effectively destroyed, the Vietnamese Communist Party would be politically helpless in the face of China’s plans to transform Southeast Asia into the first sphere of influence in its pursuit of hegemony. The fifth factor favoring Dũng at the 12th party congress: his qualifications for the job. 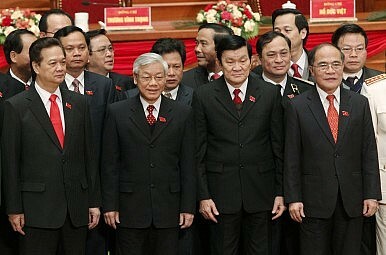 The prime minister is the most impressive leader that the Vietnamese Communist Party has. If we take nine general criteria for power in Vietnam, namely, political vision, economic development/market-oriented management know-how, political/practical wisdom, charisma, national popularity, nationalist credentials, international stature, family wealth, and family life, it is apparent that Dũng does not possess them all, but it is equally apparent that he is ahead of the other senior leaders on most counts. None of his peers have the international stature, extensive connections abroad, and personal relations with other world leaders that Dũng has cultivated during his many foreign visits over the past two years, including his latest trip to Japan for the Seventh Mekong-Japan Summit. Let’s consider another leadership trait. If the mark of a strong political leader is the courage to make a difficult decision at the right time, then the prime minister seems to have lived up to the original meaning of his name “Tấn Dũng” (which translates as “exceedingly courageous”). The first key decision moment came for the top four VCP leaders and the ruling Politburo, when on May 1, 2014, China installed its oil rig HD-981 inside the special economic zone claimed by Vietnam. Of the top state officials, only Dũng stood firm. Ten days later, on May 11, at the 24th ASEAN Summit in Naypyidaw, the prime minister lodged an official protest. By standing up to the Chinese, Dũng proved himself in the eyes of the armed forces, the Central Committee, and the Vietnamese public. Later, the prime minister surprised observers by publicly denouncing U.S. imperialism during the 40th anniversary celebrations of the liberation of south Vietnam, in the process winning the admiration of Vietnamese patriots and those anti-U.S. conservatives within the Vietnamese Communist party for speaking out against the U.S. even while seeking Washington’s support to counter China. The sixth and final factor: Dũng seems to have earned the strong support of the armed forces and the powerful military elite, not only because of his nationalist stance but also because of his military modernization programs in pushing for the rapid development of the defense industry and purchases of jet fighters and six Kilo submarines during his 2009 visit to Russia, a visionary move in light of the Chinese encroachment into the South China Sea (which Vietnam calls the East Sea). Any resistance from Trọng and his pro-Chinese Politburo leaders to this kind of military preparedness may have cost them their claim to leadership in the eyes of the military elite, especially among nationalistic generals who have now rallied behind Dũng. The latest evidence of the military support that Dũng now commands is his presiding over the IXth “Determined To Fight And Determined to Win Convention” of the national armed forces in Hanoi on July 1 (with Trọng, Sang and Hùng all absent). I would not go as far as Lê Hồng Hiệp and call Dũng “Vietnam’s most powerful politician over the past thirty years.” Like Carl Thayer, I would suggest that the prime minister is presently the most capable of all the top Vietnamese Communist Party leaders, and the one best able to lead Vietnam and safeguard its sovereignty. However, if Vietnam’s next leader is to be truly effective and powerful both at home and abroad, the next Central Committee should unify the current separate party-state positions into one politically unified leadership post, by electing Nguyễn Tấn Dũng president of Vietnam, commander-in-chief of the Vietnamese armed forces, and general secretary of the Vietnamese Communist Party. The party should also begin work to create a modern republic with features such as a presidential democracy, a bicameral congress, two-party system, and a free press. This will avoid the rise of dynastic rule or dictatorship of whatever type, and enable it to better manage sociopolitical ills such as corruption. Chánh Công Phan, Ph.D. (University of Chicago), is an assistant professor of humanities and philosophy at the San Jose State University, San Jose, California, and editor of The Eastern Paths to Philosophic Self-Enlightenment (Kendall Hunt, 2002).